Ancheer Fitness All-in-One Weights Bench:Work your muscles to the max! 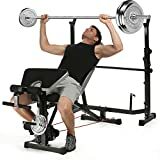 Multifunctional weight bench for performing a range of exercises including bench press, leg extensions, leg curls, preacher curls, crunches and sit-ups. Heavy-Duty Construction:Height adjustable back rest with one flat and two incline positions lets you achieve the right angle to target different areas. Also equipped with a removable preacher curl pad plus a leg training unit with foam rollers.Ultra heavy weight capacity (250kg). Adjustable the Barbell Rack Height:Features a barbell rack for use with adjustable dumbbells and barbells and exercise guide to conform to your workout needs.Great choice for any level user looking to building, toning and maintaining muscle mass. Thick Upgraded Bench Padding:Thick seat cushion and back rest for added comfort and durability.Comfortable foam rollers for leg curl/leg extension. Enhanced Safety: With built-in Safety Hooks and no-pinch design to prevent injury to hand and grip.Quick position adjustment with safe locking bolt system.2-year warranty.PLEASE NOTE: With Accessaries,but the weights are not included. There’s no need for you to enroll at the gym to lift some weightsSave time and moneyby performing your body-strengthening workouts at home with the Ancheer Folding Olympic Weight Bench! This bench allows for a variety of strength-training workouts.With just one machine,you can perform both upper and lower muscle-strengthening exercises.||Ancheer is proud to be able to offer this high quality Weight Bench.You can enjoy strength training in the comfort and convenience of your own home with the Ancheer Adjustable Weight Bench- the ultimate workout package! Equipped with a removable preacher curl pad to perform your favourite arm exercises plus a leg training unit with foam rollers. Features a long barbell rack for use with adjustable dumbbells and barbells for heavier lifts and to diversify your workouts.